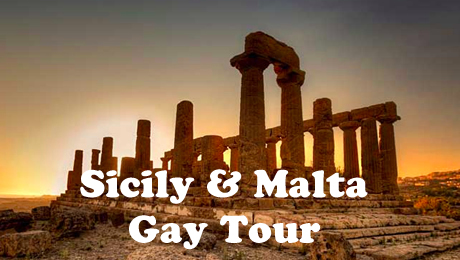 Palermo, Monreale, Segesta, Scopello, Agrigento, Mt.Etna, Taormina, Siracusa, Valetta, Mdina, Rabat, and more! This itinerary is being published about a year in advance of the tour. We reserve the right to add and/or subtract some of the sights visited on the trip as we become aware of further opportunities. Early-evening welcome drink in the hotel followed by dinner nearby. Please	Note: Please do not purchase any flights until we’ve reviewed your intended schedule to make sure your arriving and departing flights coordinate with our tour logistics. See Arrival & Departure Logistics on this page for further information regarding arrival into Palermo. Please	Note: If you would like us to set up any pre-tour nights for you at the group hotel in Palermo please let us know. There’s a great deal to see in the city, and we’ll only be able to scratch the surface. Walking tour in the center of vibrant (some might say chaotic and quasi-gritty) Palermo, taking in some of the city’s more interesting churches, piazzas, and mesmerizing street food markets. We include the Palazzo dei Normani — a monumental complex started by the Arabs and enlarged by the Normans - which contains Palermo’s artistic highlight, the Cappella Palatina, with its glowing Byzantine-influenced mosaics. Afternoon excursion up to the nearby town of Monreale whose cathedral boasts the most extensive and accomplished Christian mosaics in the world, dating from the 12th century. Its cloister is an elegant arcade supported by 216 twin columns, no two of which are the same. Day-trip out to the unfinished ancient Greek temple of Segesta, rising in glorious isolation amid beautiful pastoral countryside. Started around 400 BC, the site is known for its harmonious proportions and the splendor of its natural setting. The ancient stone looks beautiful against the green hills and blue sky. Also visit the nearby small Greek theater, its hilltop situation offering remarkable views. The picturesque Gulf of Castellammare then beckons. Nature preservationists have fought hard for this stretch of coastline which, unlike some other parts of the Sicilian coast, has maintained its natural beauty from unsightly development. The charming hamlet of Scopello on the gulf is a delight to stroll around, and we’ll enjoy lunch here before heading back to Palermo with the rest of the day free to explore on your own. We depart from Palermo heading to Sicily’s wild and remote inland area to find one of the island’s most notable and historic wineries. Operated by a noble family since 1800 we enjoy an interesting tour, tasting, and lunch at this property that is beautifully set on 1,300 acres. Until her recent death the Contessa here was the doyenne of Sicilian cooking, having penned several cookbooks. Continue to our small converted farmhouse near Agrigento in the south of Sicily where we spend two nights and enjoy their lovely hospitality and excellent dinners. 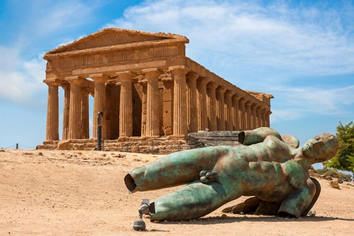 Explore Agrigento’s Valley of the Temples, one of Europe’s greatest archeological sites. Only ruins now remain of perhaps Magna Graecia’s foremost colony, dating from 582 BC. Of its many temples the Temple of Concordia is one of the best-preserved Greek temples in the world. We will also visit the interesting Archeological Museum housing a large collection of artifacts from the excavated site. Weather permitting we can enjoy a picnic lunch in a lush garden of citrus and olive trees interspersed with 300 labeled species of plants. 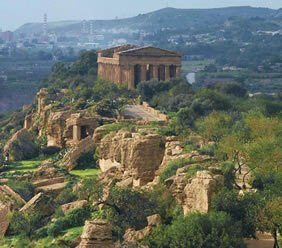 Leisure time in the afternoon for relaxing at the hotel or exploring the city of Agrigento. Depart Agrigento, again into the remote and rugged interior of the island, heading for the Villa Romana at Casale with its extraordinary 4th-century-AD floor mosaics that were preserved because of a flood that buried them in mud in the 12th century and remained covered over until the 19th. The astonishing floor mosaics decorated every room of this ancient Roman villa. On to eastern Sicily now with a stop on the very fertile slopes of Mt. Etna, an active volcano that towers 11,000 feet above the Ionian Sea. 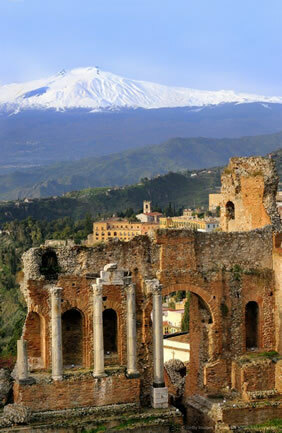 Its smoking summit is a landmark over much of Sicily. Groves of orange, lemon, fig, and olive trees blanket Etna’s lower slopes, but Etna is also known for its wines, so we make a stop at a beautiful winery for a splash or two before continuing to Taormina. 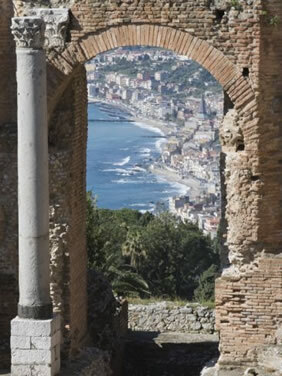 Many will claim that Taormina is Sicily’s most beautiful town, with Etna rising in the background and the town perched very high up above the turquoise sea. It’s got beautiful palazzi, cliffs, bougainvillea and wisteria climbing the walls, and stunning views. We’ll visit the magnificently sited Greek Theater, built in the 3rd century BC but almost completely remodeled by the Romans later. As far as locations go it's a stunner. The remainder of the day is free to explore the town on your own. You might wish to have a wander around the gardens of the Villa Comunale, created by an Englishwoman in the late 19th century. Or for something more active you can walk up Monte Tauro to the Sanctuary of Madonna della Rocca for some even more awesome views. Taormina also has gobs of shopping, sweets shops, and cafes. Getting a little lost (but you won’t really) in the back alleys is also enjoyable. The last leg of our Sicilian itinerary brings us to remarkable Siracusa (Syracuse). By 600 BC Siracusa had become one of Europe’s greatest cities. Before reaching the center of the city we’ll stop on the outskirts to visit the Archeological Park with its 15,000-seat Greek Theater, the most complete theater in the Greek world dating from the 5th century BC, along with the cave known as the Ear of Dionysius. Later we move on to Ortigia island, the actual core of Siracusa for some 2,700 years, where our hotel is located. Morning walking tour of Ortigia island—part medieval, part baroque — including the Duomo (cathedral), with its fascinating patchwork of styles, its Norman walls embedded with columns from a 5th-century BC temple, with fragments from the 7th century, all behind a 17th-century facade. The piazza on which the Duomo stands is certainly one of the most impressive in all of Italy. Free time later for strolling the port and back streets of Ortigia — a wonderfully charismatic place. After some free time this morning in Ortigia we transfer to the port of Pozzallo where we board a high-speed ferry (about two hours) to Valletta, Malta, arriving there in the late afternoon. Transfer to our beautiful and historic hotel and settle in for three nights. Valletta is the charming capital city of Malta, population close to 400,000. Its rich history will be revealed as we explore the city center on foot. We’ll see the Upper Barraka Gardens perched high above Grand Harbour; buzzing Republic and Merchant streets; the interior of Valletta’s pride and joy, St. John’s Co-Cathedral (with a Caravaggio on display); and the sumptuous State Rooms of the Grand Master’s Palace. 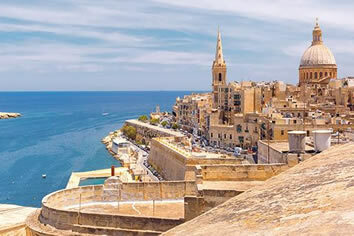 The afternoon will be spent taking in the so-called Three Cities (Vittoriosa, Senglea, and Cospicua) wth a walking tour of the historical center known as Collacchio, the original city occupied by the Kinghts of Malta in the 16th century. Picturesque narrow streets and stunning views make the Three Cities a delightful excursion. Malta’s former capital, Mdina, is a time capsule of medieval buildings and a world unto itself. It sits in a comanding position on a high ridge and was the site of Bronze Age settlements. The Romans were there. So were the Arabs. Then the Normans. Today it’s a fine example of a walled medieval city packed with historic mansions of Maltese nobility. The town is also known for its elaborate, iconic door knockers. Rabat, meaning “suburb,” adjoins Mdina and had strong ties with the Roman period and St. Paul. Dingli is a rural area and one of the largest stretches of countryside in Malta, and the Dingli Cliffs are the country’s highest point. The views here are wonderful from the 700-foot cliffs and it’s a lovely place for a stroll. 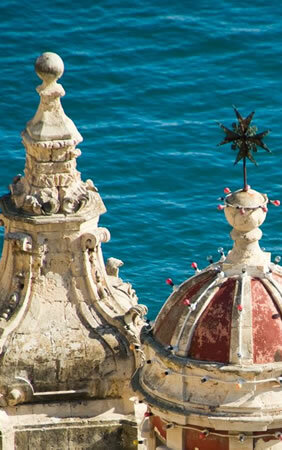 We return to Valletta for a free afternoon (last-minute shopping? pool time?) before meeting for our farewell dinner. Transfer on your own to the Valletta airport (MLA), which is just four miles from the hotel. Please Note If you’d like to extend your stay at our excellent hotel in Valletta and explore further afield in Malta or the neighboring island of Gozo we can set up extra nights for you. • Passports and other expenses of a personal nature such as minibar charges, laundry, phone calls, etc. We spend our nights in a mix of upscale city, town, and rural accommodations that fall into the 4- or 5-star category, although the masseria (converted farmhouse) near Agrigento isn’t officially classified. These are the accommodations we intend to use on the tour. However, as this itinerary is being published a year in advance of the tour, we reserve the right to make changes. Cleverly constructed in the heart of the city out of a former stock exchange building combined with a former monastery and a centuries-old palazzo. Spacious rooms (about 120 rooms all together) with hardwood floors; original Liberty design; frescoed salons; a good restaurant of its own should you wish to dine in-house on your free evenings; a lovely central cloister where you can enjoy a drink; bar; and a spa. Our lodging is a traditional masseria – a 19th-century farmhouse on a country estate – that has been renovated and modernized. Although no longer a working farm it maintains its agricultural and historical roots with classic charm. It once belonged to a Sicilian noble family and sits on a hill facing towards the sea. The estate is adorned with herbs and aromatic plants such as thyme, rosemary, and lavander as well as dwarf palms, carob trees, and a sweeping olive grove. The 10 guest rooms have been furnished with care, a pleasing style, and comfort. Located in the center of town there are 63 guest rooms with big windows looking out to the Bay of Naxos far below in this hundred-year-old building that underwent a recent renovation to put in Brazilian rosewood furniture, smoked oak floors, and bathrooms with volanic stone and Sicilian mosaics. Its glass-walled restaurant has lovely views, and there’s another restaurant and bar adjoining the very hi-tech pool. Built around 1890 this 58-room hotel has retained its handsome Liberty-style charm. Commanding a sea-front position the propertyenjoys anideal setting: across the street from a marinaand walking distance from Ortigia’s sights. Inside, you are greeted by an old-fashioned elegance with marble columns, marble floors, high ceilings, huge Venetian-glass chandeliers, and accents of antique furniture. There’s a very highly regardedrooftop restaurant overlooking the waterfront and the town and also a small spa. 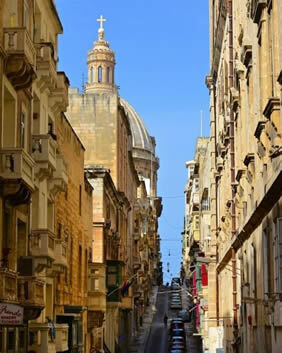 Our selected property is a Valletta icon and a fine example of the city’s architectural traditions. This member of the Leading Hotels of the World has seven acres of gardens and is within walking distance of the city’s sights. Several dining options include a grand restaurant, a casual café, and afternoon tea. There are a couple of lovely bars, including one poolside. The hotel has a very interesting history, having started construction in the 1930s, was bombed during World War II, then rebuilt. British royalty and actors have stayed here over the years, and after a recent 18-month refurbishment it sparkles with five-star luxury. At the time of publishing this program Palermo’s airport is served by nonstop flights coming from Rome, Milan Linate, Milan Malpensa, Munich, Paris Orly, London Heathrow, London Gatwick, Madrid, and perhaps some minor European airports. Valletta’s airport is served by nonstop flights departing to Rome, Milan Linate, Frankfurt, Munich, Zurich, Paris De Gaulle, London Heathrow, London Gatwick, Amsterdam, Brussels, Madrid, Barcelona, Lisbon, and perhaps some other European airports. Connecting through some of these cities might require an overnight. The weather in Sicily and Malta in May is usually pleasant. The average high temperature is 70 to 75 F.; the average low is 55 to 60 F. Typically, rainfall is not more than 1 inch for the month. This is an easy cultural tour, but the cities, towns, and sights that we visit have to be explored on foot. We cannot drive through them on our bus (even on a smaller bus) as the roads in the city centers are from medieval days. Plus, the sites of antiquity also require walking to see them. The ground is often uneven and sometimes hilly. In general, adding it all up, you should be comfor table walking a total of about 2 or 3 miles each day (but not all at once) as well as standing while visiting many of the sights. Occasionally there are places to take a seat. Sturdy comfortable walking shoes are strongly advised for our explorations. A daypack would be handy. We have structured the days in this program in the most logically flowing way in order to keep driving times to a minimum. However, Sicily is large, and we cover a lot of it. Additionally, we’ve made an effort to reduce the number of different hotels we stay at in order to minimize packing and unpacking. This, however, means that we have to drive more to see the sights. None of the driving is done at long, uninterrupted intervals. We stop throughout the day for our visits, thus breaking up the day’s activities. Our transportation will be in comfortable small tour buses, and at no time will it feel like an endless road trip. A small group surcharge of $200 per person will be added to a group size less than 11 travelers.